Scientists working at Wayne State University in Detroit have discovered a way to control estrogen receptor changes during pregnancy, which could lead to a therapy preventing preterm birth. Preterm birth is the most significant cause of infant morbidity and mortality in the U.S.
“To understand why preterm birth occurs, we need to discover the mechanisms that govern the onset of normal-term labor, which unfortunately, despite decades of research, we still do not understand,” says Jeyasuria Pancharatnam, co-investigator and assistant professor of obstetrics and gynecology. Estrogen is thought to signal the onset of labor by helping to regulate the contraction of the uterine muscles. Jeyasuria’s research team discovered that the uterine muscle changes the ability of the estrogen receptor to use the estrogen to induce contraction by changing the form of the receptor. The form expressed in the pregnant uterus across gestation is an estrogen receptor that blocks the ability of the uterine cell to contract during pregnancy. 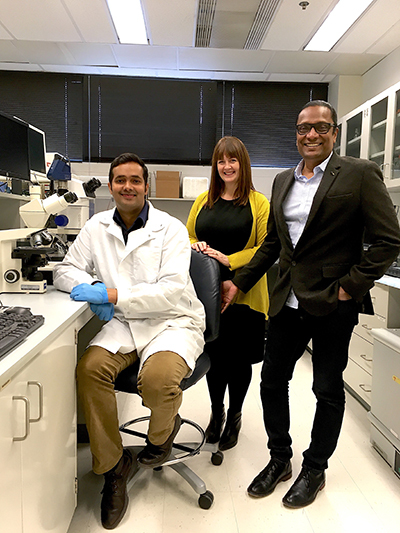 Jeyasuria and his wife, Jennifer Condon, associate professor and study co-investigator, run their lab in the C.S. Mott Center for Human Growth and Development. Both are members of the Perinatal Research Initiative, funded through the National Institutes of Health’s Eunice Kennedy Shriver National Institute of Child Health and Human Development’s perinatal research branch at WSU. Postdoctoral fellow Prashanth Anamthathmakula also is working on the research. Despite increasing knowledge about the pathological mechanisms associated with preterm labor and subsequent birth, the rates of preterm birth continue to increase. More than 9.6 percent of all births in 2015 occurred before 37 weeks of gestation. The rate of preterm birth in Detroit is the highest of cities in the U.S. at 14.5 percent, according to the March of Dimes. “Our lab has concentrated our efforts on estrogen signaling, as it is important to the onset of the labor process and plays a critical role in the expression of proteins that enhance contractions, termed contractile associated proteins, or CAPS,” says Jeyasuria. CAPs are expressed late in gestation and bring uteruses from inactive to active states. Future studies will use an animal model system to determine if the researchers can modulate the form of the uterine estrogen receptor available to confirm the functional relevance of the switch in uterine muscle cell estrogen receptor forms. Estrogen depends on a receptor protein to convey a contractile signal. Jeyasuria and his team hypothesize that because estrogen levels are elevated throughout pregnancy, the changes in the receptor allow the estrogen to tell the muscles to contract. They will continue to study the receptors and think that contractions at term are mediated by estrogen receptor alpha isoform changes. Isoforms are different proteins made from the same gene by rearrangements of the message that comes from DNA. Messenger RNA can be put together differently depending on another set of proteins called splice proteins. “As their name suggests, these splice proteins can differentially splice the intermediate RNA (heteronuclear RNA) to create alternate spliced isoforms,” says Jeyasuria. “We found that some of these alternate isoforms actually block estrogen signaling. The team hopes to get grant funding to explore the functions of a number of alternatively spliced estrogen receptor isoforms in pregnancy using animal and human models. Mutations affecting the multiple promoter regions of the estrogen receptor alpha’s gene, which regulate expression of the receptor’s isoforms, may serve as markers to preterm birth. The study aims to fill a gap in understanding the receptor function in the pregnant uterus and in the control of labor during pregnancy. Previous articleBlog: The Future of Sweet?